Tucked away between rugged mountains and the Adriatic Sea, Montenegro is a tiny European country. We read about this offbeat place somewhere and decided it’s definitely worth a visit. Starting off from its capital city Podgorica, we road tripped up north towards Durmitor National Park with its black mountain ranges, dense pine forests and clear lakes. We set up a base in Zabljak and headed out for a scenic hike around Black Lake. With the deep green forest reflected in the glistening water, the place awed us. After hiking for about three hours, we treated ourselves to a bowl of fresh raspberries and blueberries that were being sold in stalls on the road leading to the lake. We then proceeded to Tara Canyon – the deepest canyon in Europe. At 82 kilometresin length and 1,300 metres deep, the endless gorge, with a turquoise river flowing through it, left us absolutely wide-eyed! The chilly weather had us craving hot beverages. So we headed up to a quaint café overlooking the canyon for some delicious hot chocolate and mulled wine. After taking in Durmitor’s beauty, we drove south towards Montenegro’s sunny and sparkling coastline. Three hours and 170 kilometres later, as our road bent into the postcard-landscape of the bay and town of Kotor, our jaws hit the floor. It was a spellbinding view. We stopped at literally every bend to take it all in until we reached the town! Kotor stole our hearts. 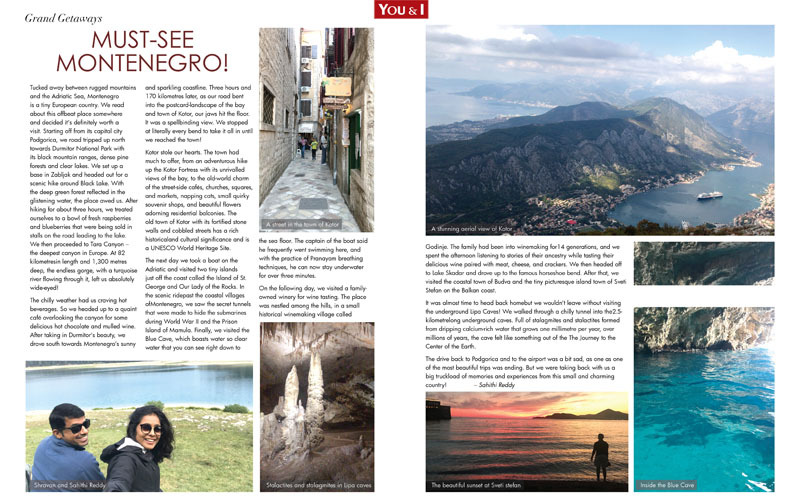 The town had much to offer, from an adventurous hike up the Kotor Fortress with its unrivalled views of the bay, to the old-world charm of the street-side cafés, churches, squares, and markets, napping cats, small quirky souvenir shops, and beautiful flowers adorning residential balconies. The old town of Kotor with its fortified stone walls and cobbled streets has a rich historicaland cultural significance and is a UNESCO World Heritage Site. The next day we took a boat on the Adriatic and visited two tiny islands just off the coast called the Island of St. George and Our Lady of the Rocks. In the scenic ridepast the coastal villages ofMontenegro, we saw the secret tunnels that were made to hide the submarines during World War II and the Prison Island of Mamula. Finally, we visited the Blue Cave, which boasts water so clear water that you can see right down to the sea floor. The captain of the boat said he frequently went swimming here, and with the practice of Pranayam breathing techniques, he can now stay underwater for over three minutes. On the following day, we visited a family-owned winery for wine tasting. The place was nestled among the hills, in a small historical winemaking village called Godinje. The family had been into winemaking for14 generations, and we spent the afternoon listening to stories of their ancestry while tasting their delicious wine paired with meat, cheese, and crackers. We then headed off to Lake Skadar and drove up to the famous horseshoe bend. After that, we visited the coastal town of Budva and the tiny picturesque island town of Sveti Stefan on the Balkan coast. It was almost time to head back homebut we wouldn’t leave without visiting the underground Lipa Caves! We walked through a chilly tunnel into the2.5-kilometrelong underground caves. Full of stalagmites and stalactites formed from dripping calcium-rich water that grows one millimetre per year, over millions of years, the cave felt like something out of the The Journey to the Center of the Earth. The drive back to Podgorica and to the airport was a bit sad, as one as one of the most beautiful trips was ending. But we were taking back with us a big truckload of memories and experiences from this small and charming country!